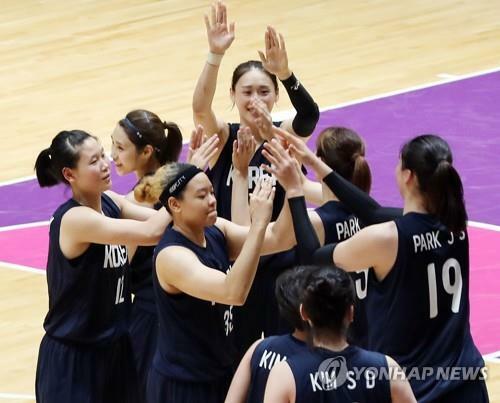 JAKARTA, Aug. 30 (Yonhap) — On a day with two gold medals for South Korea at the 18th Asian Games, the unified Korean women’s basketball team stole the thunder by reaching the final on Thursday. The team of nine South Koreans and three North Koreans blew out Chinese Taipei 89-66 in the semifinals, setting up a date with China in Saturday’s gold medal game. Park Ji-su, a South Korean center for the Las Vegas Aces in the WNBA, made an impressive Asiad debut with 10 points and 11 boards in 21 minutes off the bench. Ro Suk-yong, Park’s sidekick in the low post from North Korea, scored 17 points on 7-of-11 shooting. South Korea is the defending champion but North Korea has never won a medal in Asiad women’s basketball. Aside from women’s hoops, the Koreas has joint teams in rowing and canoeing. The unified dragon boat racing teams grabbed one gold and two bronze medals. The men’s basketball team couldn’t get past the semifinals, as Iran handed defending champ South Korea an 80-68 loss. In a rematch of the 2014 gold medal game, Iran got the upper hand this time as Hamed Haddadi filled up the stat sheet with 23 points, seven boards, eight dimes and four blocks. The day’s first gold medal came from track cycling. Lee Ju-mi won the women’s individual pursuit title by catching Wang Hong of China with one lap left in the 12-lap, two-rider final. Lee had earlier helped South Korea to the team pursuit gold medal. The women’s handball team then collected South Korea’s seventh Asiad gold medal with a 29-23 victory over China. South Korea never trailed in the final, with Jung Yu-ra leading the balanced attack with eight goals. South Korea has moved to 39 gold medals, still in third place behind Japan (59 gold medals) with three days remaining. South Korea claimed three more medals from judo, including a pair of silver medals from An Chang-rim in the men’s under-73kg and Kim Seong-yeon in the women’s under-70kg. Elsewhere, South Korea defeated Japan 5-1 in the first super round game in baseball, as it inched closer to its third straight appearance in the final. The two-time defending champion pounded Japanese amateur pitching for three solo home runs. South Korea will face China on Friday to close out the super round, and a win will mean a trip to Saturday’s gold medal game. In men’s volleyball, South Korea punched its ticket to the final by beating Chinese Taipei 3-2 (20-25, 25-20, 25-16, 20-25, 15-12). The 21st-ranked South Korea will try to win its first Asiad men’s volleyball gold since 2006 against Iran, the defending champion and world No. 8. Also on Thursday, South Korea picked up a pair of medals from canoeing and kayaking at Jakabaring Rowing & Canoeing Regatta Course in Palembang, co-host city of the Asian Games with Jakarta. South Korean men won silver in the kayak four (K4) 500m race behind Kazakhstan. Cho Gwang-hee, Cho Jeong-hyun, Choi Min-kyu and Kim Ji-won finished with a time of 1:25.313, 1.110 seconds behind the gold medal team. In the women’s kayak single (K1) 500m final, Lee Sun-ja grabbed bronze in 2:02.532. She was more than three seconds back of the champion, Li Yue of China. These were South Korea’s first two medals from kayak. Joo Hyun-myeong won bronze medal in the men’s 50km race walk earlier Thursday. This was South Korea’s fifth medal from athletics. In soft tennis, Kim Ki-sung and Mun Hye-gyeong got silver in the mixed doubles, while another South Korean team, Kim Beom-jun and Kim Ji-yeon, earned bronze.